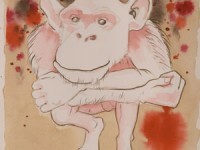 In 2004, a group of artists visited Primarily Primates and created artwork to help raise funds for the sanctuary. That artwork was featured in an art show in Austin, Texas, entitled “The Texas Monkey Project.” Here are some of the pieces that appeared in that show. 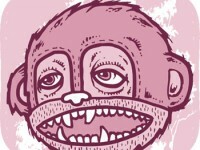 For the “Who is Oliver?” web episode, several illustrations were created by three artists to tell help tell his story. Here are some of the illustrations created by Heyd Fontenot and Jimmy Tovar.